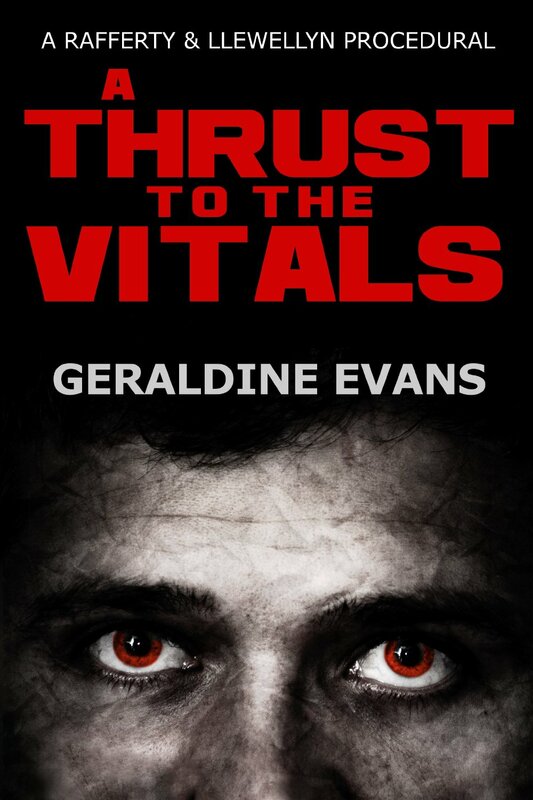 Stopping by today is Geraldine Evans who is going to talk about her latest ebook release A THRUST TO THE VITALS. It is actually the tenth of a fifteen book (so far) series. I’m sitting here with a nice strong cup of tea, as I’m sure Gerrie is, so let’s get started. Gerrie, I liked the book. But some of the early reviews have been less than kind. I know that hurts so I’m not going to ask if that bothers you – of course it does. But the criticism seems to be you write in a British style and that doesn’t appeal to Americans. Is it something you are finding? No, not really, I think it was an issue with this book because I’ve been experimenting with Amazon’s Categories and I put this one in International Crime and Mystery. Big mistake! Although it is ‘international’ for everyone but my fellow-countrymen, readers were clearly expecting a big book with globe-hopping characters. I’ve now put it in ‘Cozy Mysteries’. Hopefully future reviewers will judge it on its merits. Anyone, be they American or British, who enjoys a bit of humour with their mysteries, might well enjoy it. I put the question out in a mystery reader group I belong to – these are all very experienced mystery readers. And the general consensus was this is a side effect of the if it’s free it’s for me syndrome. You put something out free for a while to get reviews and there are a lot of people who grab stuff just because it is free without asking themselves if this is a genre they even usually read. And all agreed, where would mysteries even be without British mysteries – after all it was Agatha Christie really got it all going. Yes, I think that’s true about freebies. I won’t be in a hurry to offer another book of mine to all and sundry! But you live and learn and ebooks and their promotion are still things most authors are trying to get right. I should have taken heed of the old maxim that something that costs nothing isn’t valued. In future, I think I may restrict freebies to serious reviewers. I will also steer clear of branding my novels as ‘International’. My DI, Joe Rafferty, is far from a globe-trotting hero. He’s a working-class copper (as are most British police officers even in these days of graduate recruitment) with a family not averse to back-of-a-lorry-bargains — which gives me plenty of opportunity to create a sub-plot full of family mayhem. Yes, I cut my teeth on Agatha Christie. A lot of people deride her as a writer. I’m not one of them. I think it’s a form of literary snobbery. I’ve suffered from it myself as, like Agatha’s, my books are far from ‘highbrow’. But her books are still going strong when those of her detractors have often faded into obscurity. I hope my books fare as well as the redoubtable Agatha’s. So. Irish Catholic. I’m recovering myself. Do you think it influences your writing or is it too far back? God, yes! I’ve given my lapsed-Catholic DI, Joe Rafferty, a conscience that nags him almost as much as his Ma! (when she isn’t buying dubious ‘bargains’, that is). No, the Irish influence is very recent. Both my parents were Irish (mum from Dublin and dad from Limerick). I used to visit Dublin every summer when I was a kid. My dad was employed by London Transport as a driver on the London underground and my mum was able to get reduced fares).Clontarf was my maternal grandmother’s home. She was a widow and lived alone: I often think nowadays how that poor woman survived having her tiny home invaded by four boisterous youngsters! It was a three-roomed flat (no bathroom) and she had to give up her bed and sleep in the kitchen for six weeks every summer when we descended upon her like a swarm of locusts. No wonder she prayed a lot and went to 7 o’clock Mass every morning. The church was the only place she could get some peace. I haven’t been over to Dublin for years (it’s the lure of the sun for the inhabitants of my rain-sodden little island that draws me to holiday somewhere warm). I really must go again soon and renew some old friendships. You are a prolific writer. Do you have a day job or at what stage were you able to get rid of it? Thanks to Amazon’s Kindle, I’m now able to write full-time. But for most of my writing life I had a day job and wrote evenings, weekends and holidays. It was only after I turned indie in 2010 that I began to earn a reasonable living. Traditional publishing is not a good payer when you’re judged to be a midlister, as I was. Maybe, your readers would be interested to read more about my decision. I go into it more fully in a recent guest post I did on Joe Konrath’s blog. Here’s the link. Very interesting blog. I’m following it myself now. So why a police procedural? 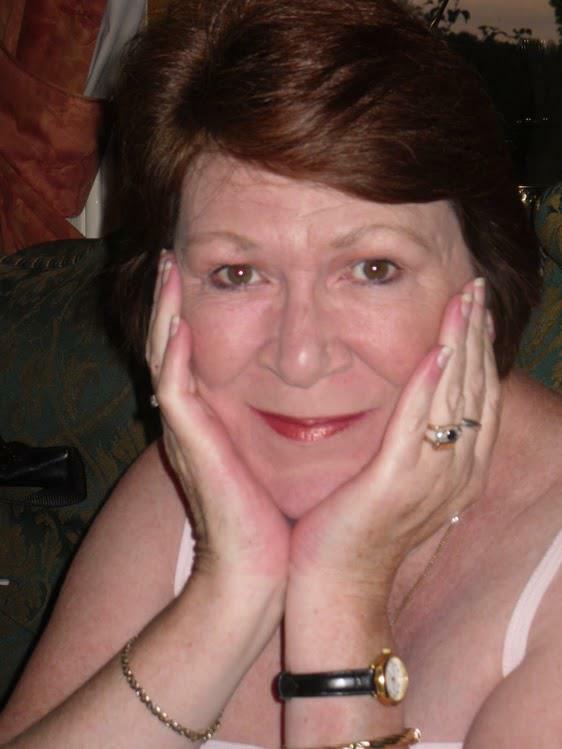 Were you or your late husband or any of your family coppers? No. No one in my family was a copper, though I’ve known several and my late husband’s ex-brother-in-law was a police dog-handler. (George, my husband, was a grease monkey, a mechanic). I was drawn to writing procedurals after a (failed) attempt to get a career as a romance writer off the ground. I was aiming at the Mills & Boon (Harlequin) market. I never managed to get a novel accepted by them, though I did get a romance taken by Robert Hale. They then rejected my next effort in the genre, which made me good and mad. I felt like murdering someone. So I did. I turned to a life of crime and my very first mystery, Dead Before Morning, was accepted from Macmillan’s slush pile and sold on to St Martin’s Press and Worldwide. If only I’d listened to that little voice advising me to change genre several books’ earlier, I could have saved myself a lot of grief. I’m not at all a romantic sort of woman. I don’t even like pink. And when Mills & Boon editors offered a little feedback, it was: Too much plot and not enough romance, which should have told me something a whole lot sooner. You have been with a publisher for a long time. Now that you are putting your backlist out in ebook form yourself, how are you finding the wild and wooly world of the indie? What do you like most and what do you hate the most? I love it! I love everything about being an indie. When you’re traditionally-published, unless it’s been decided that you have best seller potential, you have no control over anything and any suggestions you make are generally ignored. You’re given a pat on the head and get told to ‘run along’. Now I can decide on the book’s cover, its publication date, description, sale price, category (!) and reviewers (another !). Best of all, I actually earn a living income. Some months I even feel rich! Glorious. I’d say the need to spend much of my time on social media is a drawback, but it’s a drawback that traditionally-published authors share, so it’s not really an indie ‘hate’. I just bought How To eFormat Your Novel for Amazon’s Kindle: A Short But Comprehensive A-Z Guide and you have explained the process in a far more easily understandable way than any other I have seen. I wish I had it last February and March – my hair would be far less gray! I’m ashamed to confess that I haven’t looked at my so-called work in progress for weeks. My time has been taken up with getting my backlist formatted for kindle and the other ebook retailers. I’m doing the last one to which I hold the rights, then I can get on with the WIP. Future writing plans? I’d like to write another historical novel. My (so far) one and only historical is my bestseller on kindle UK, so I really must give my fans in that genre something else to read before some other author snatches them from under my nose. I would also like to return to writing short non-fiction. I had quite few articles published back in the days when the rejections for my novels were coming thick and fast. The non-fiction kept me sane and gave hope something to cling to. I’ve also got around half-a-dozen other novels mouldering away in drawers, which I think deserve a second look and another turn through the laptop. There are so many things I’d like to do that I’m going to have to have myself cloned in order to achieve them all! Authors have to be social media junkies and, although I’m not as regular in my habits as many writers, I do try to keep abreast. The drawback is that it swallows a huge chunk of time that I could devote to writing. But if you don’t attempt to get your name out there, you’re liable to sink quicker than a boulder. It’s a nicely-judged balancing act. It’s lucky that I’m a Libran, with the astrological symbol of the scales to help me with all the weighing and balancing. If you could invite any writer, living or dead, over for a cuppa and a chat, who would it be? And why? Librans are renowned for being indecisive. Unfair question! Shakespeare springs to mind. And, to leap forward to the present, Ruth Dudley Edwards, the British author of the marvellous Baroness ‘Jack’ Troutbeck novels. I’m going to allow myself one more, or rather, two, as R C Bridgestock is a husband and wife writing team. Carol and Bob were both in the police service for years and have a wealth of knowledge and experience which they bring to their police procedurals. You can be sure I not only love them for themselves, but also for all the gen I can steal. What is your favorite food? I’m partial to Indian food. I love all the spices. I like strong flavours as my sense of taste seems to be rapidly going the way of my sense of smell, hearing and eyesight. What is your favorite TV show? Another indecisive Libran selection here, I’m afraid. I love Blackadder, Have I got News For You, The White Queen and Live at the Apollo (British line up of comedians in front of a live audience). What is your favorite music? I’m a (later, obviously!) Baby-Boomer, so my first love is the music from the 60s and 70s. The Mamas and the Papas, The Walker Brothers, The Kinks, The Stones, Dusty Springfield, The Monkeys. Again , there are so many great groups and solo singers from those days, I’m spoilt for choice. Do you miss London living in Norfolk? Do you ever think about going back? And what part of Norfolk are you in? Strangely, I don’t miss London at all even though I was born and spent most of my life there. Funnily enough, I’ve seen more shows since moving to Norfolk than I ever did when I lived in London with access to the West End. I’d never move back, though, if I ever had the money, I wouldn’t mind a little pied à terre there. I live in a North Norfolk market town, about sixteen miles from Norwich. Thank you so much for being here today Gerrie, and good luck with the new book or rather the re-released book. I’m going to visit all the family later this year or early next year so that means Ireland, Scotland and England so don’t be surprised if I ring you up and tell you to get the kettle on, I’m in Norfolk! Before you go, is there anything else you would like to tell your readers or have them know about you? I had one very big problem with this book. After receiving it for review, I discovered it is tenth in a series so now, after reading it, I have to go get the first nine. Because I want to know everything about the whole Rafferty clan. The book is just the right balance of police procedural and humour. A party. A stolen invitation. A body – Sir Rufus Seward. A man everyone seems to hate. But his murder seems to have set-up Mickey Rafferty to take the fall. Before anyone realizes though, Detective Inspector Joseph Aloysius Rafferty spirits his brother away to hide in a less than desirable caravan. So while JAR, as he is called by Mickey, races to find the real murderer all the while worried that if he isn’t quick enough, he will be charged with conspiracy to pervert the course of justice. I enjoyed the character Sgt. Dafyd Llewellyn – a moral high ground kind of guy, who upholds the position of sidekick we see so often in British police procedurals, very well. And I liked how fiancé Abra is able to sit JAR down, get him talking everything through and focusing his mind to see what he missed. That looks like it will be a promising personal partnership for the Detective Inspector. ← ON TOUR WITH CHRISTINE WENGER & a chance to win her book! I was interviewed by the lovely Kate Eileen Shannon on her blog.